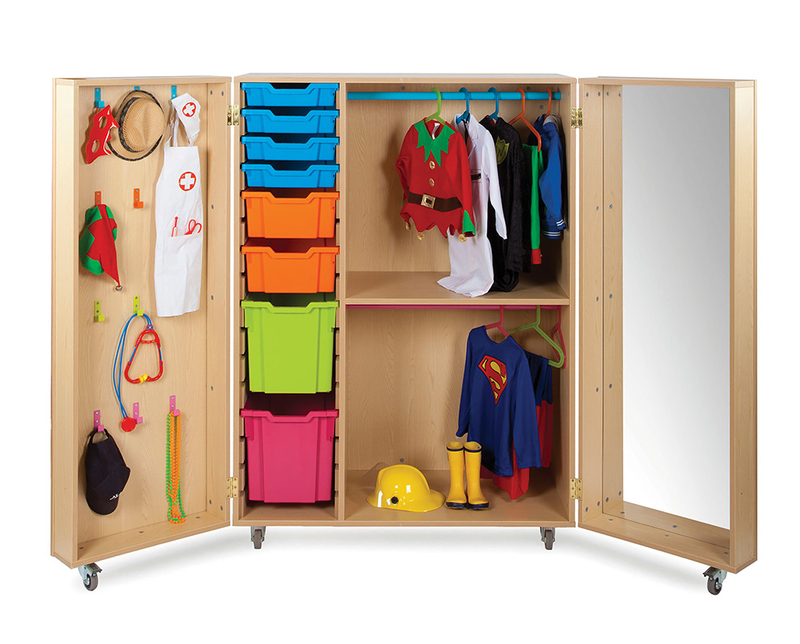 The Bubblegum dressing up cupboard is a creative and fun storage cupboard designed for use in schools, pre-schools and nurseries to encourage and promote creative play in early years. The colourful cupboard features 12 coloured hanging hooks on one opening door and a full length mirror on the other door. Inside the dressing up cupboard is a fixed shelf with 2 colour co-ordinated hanging rails for hanging children’s role play costumes. Also included are 4 shallow, 2 deep and 2 jumbo Gratnells trays which are perfect for storing away dressing up accessories and shoes. The Bubblegum dressing up cupboard is supplied in a mixture of 4 eye catching colours – cyan, tangerine, lime and pink as shown in images. Please note: the fancy dress outfits and props featured in the product images are not included. For more information please Contact Us or call us on 01733 511121. View our full range of Shelving & Cupboards and Children's Dressing Up.